A group of engineers in Japan have begun planning a two-legged humanoid robot designed to walk to the surface of the moon. Full Story. A group of engineers in Japan have begun planning atwo-legged humanoid robot designed to walk to the surface of the moon, accordingto Japanese press reports. "We decided on a human-likerobot because it's more fascinating and stimulating for us," saidassociation director Hideo Sugimoto to the Daily Yomiuri newspaper. "We'llmake an attractive robot to carry our dreams to the universe." The engineers are part of a manufacturing cooperative calledAstro-Technology SOHLA, which is based in Osaka Prefecture, a local governingunit in the Kansai region on Honshu ? the main island of Japan. The huge development costs could make it difficult for thegroup's plans to materialize, but the association is poised to try. They feel theproject could boost Japan's manufacturing industry by showing the public thatsmall and mid-size companies can have lofty goals and be competitive, the engineerssaid. Japan is known for its advanced robot manufacturingtechnology, and the association stated that it would be able to use itsexpertise in dealing with radiation and heat to develop a robot that couldfunction on the lunarsurface, reported the Daily Yomiuri. Last year, Astro-Technology SOHLA successfully built a satellitethat they named Maido Ichigo. The Daily Yomiuri reported that the associationis tentatively naming the human-like robot Maido-kun, in honor of thesatellite. The robot's estimated cost is approximately 1 billion yen(about $10.6 million U.S.). The Japanese central government and the Japanese AerospaceAgency (JAXA) are preparing to send a researchrobot to the moon in 2015, and Astro-Technology SOHLA hopes that theirrobot design will be able to accompany it on the planned mission. 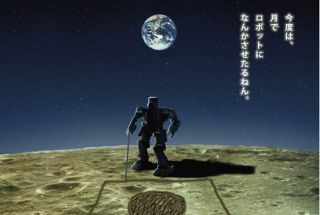 JAXA had previously considered sending a two-legged robot tothe moon, but experts felt that a wheeled robot would encounter less technicalissues, and would be more stable to travel on the moon's sandy surface. Meanwhile, NASA is already planning to send a human-likerobot, called Robonaut2, to the International Space Station aboard the space shuttle Discovery,set to launch in September. The dexterous robot will be the first human-likerobot to become a permanent resident at the space station. The robot consistsof a head and torso with two arms and two hands, but no legs.